Norway’s University of Agder is among the pioneers of higher education institutions that record and stream lectures for a major portion of their curriculum. They began ten years ago with traditional recording and post production for streaming and on-demand video. Today, their program is based in state-of-the-art IP workflow for live video production and streaming with two TriCaster® TC1 16-input UHD integrated live production systems and a suite of cameras and devices enabled with NewTek’s bi-directional IP technology NDI®. Audio, video, metadata, control and communications for video production are all handled over the network rather than with baseband video, audio and control cables, saving huge costs in infrastructure. In addition, this powers incredible flexibility and portability for the 17 cameras available for coverage across the campuses of the university. Computer systems equipped with free NewTek NDI applications can make their full display or specific application windows available as video sources on the network as well. 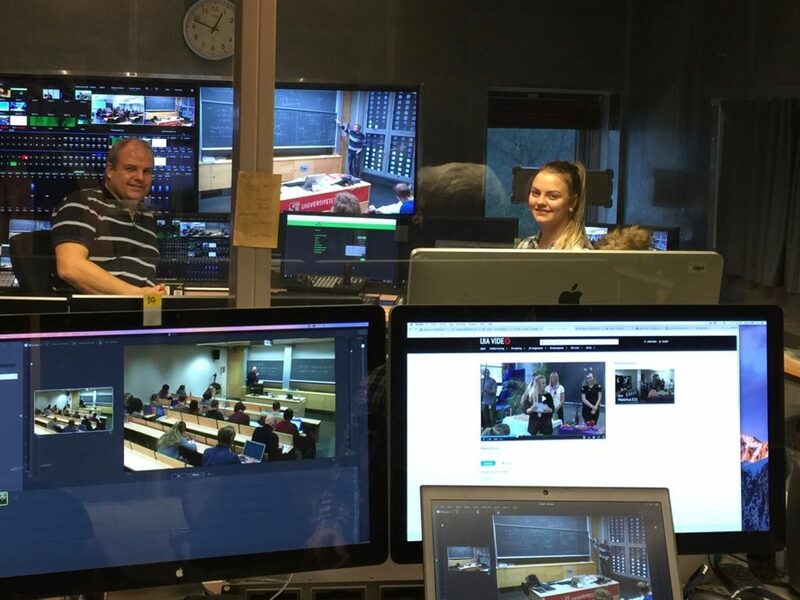 The result is that a small crew has been able to achieve 150 hours of live production and streaming per week, with improved production quality for many aspects, such as getting a live feed of the media used from the lecturer’s system or device, rather than having to aim a camera at a projection screen or video display in the classroom. “When we at first started live streaming lectures, there was always a lot of configuration to go through – finding the right IP address, which port and which protocol to use. Now, with TriCaster and NDI, any box connected in any auditorium will automatically appear on the TriCaster – it is simply plug and play, and we save a lot of time,” says Rolf Sigurd Løvland. Rolf Sigurd Løvland and intern Martine Alice Forsmo of the IT video production team at Agder University. Production at the university ranges from simple streams that use remotely operated cameras trained on a lecturer, to more elaborate productions that integrate Powerpoint slide productions and pre-recorded video into lectures, to blackboard-intensive teaching such as mathematics courses. In addition the university provides dedicated studios where faculty can make pre-recorded productions for distribution to their students. All live-streams are also made available on-demand by the university. The combination of NewTek’s All-IP TriCaster TC1 production systems with NewTek and third party NDI-enabled cameras and applications has made it possible for the university to accomplish all these production options with a major savings in costs and time versus traditional production methodologies.